I moved to San Francisco four years ago after a few years of trying in vain, and spent every last dime I had doing it. Since then, I’ve lived in market-rate and rent-controlled housing, been totally broke and not broke, been a tech worker, an hourly canvasser, a tenants’ rights activist, and struggled to find a job at all. Lately, I’ve heard a lot of kvetching about how Jane Kim’s mayoral campaign message of “This is our city. Let’s take it back” is “divisive”, “not inclusive”, “zero-sum”, “us vs. them”. To which I have to say: Have you looked around San Francisco lately? 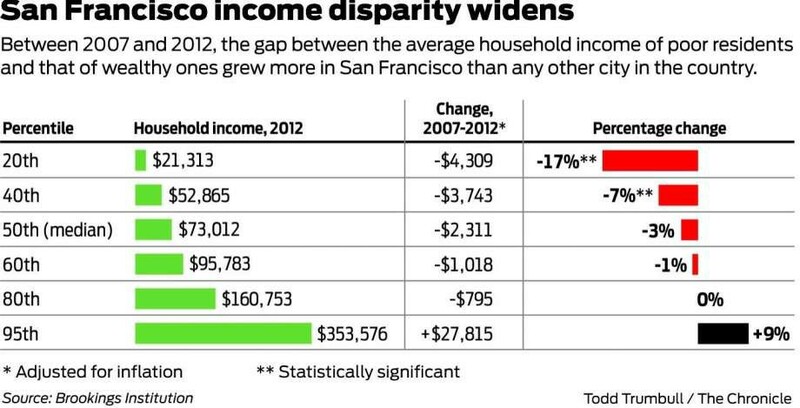 From the SF Chronicle: it’s only gotten worse since 2012. It is us vs them: not “transplants vs. natives,” but San Franciscans versus the extreme concentration of money and power that entrenches racism and classism, pits us against one another, and oversaw an exodus of black, Latinx, and immigrant communities from our city, who are systematically locked out of new well-paying jobs and high-end housing while targeted by eviction and mass incarceration. MIT economist David Autor calls the Bay Area a ‘barbell shaped economy’, with “well-paid “knowledge economy” jobs at the top end of the market, and loads of low-paid service sector jobs at the bottom.” SF income inequality is currently comparable to sub-Saharan Africa. I, a transplant and ex-techie myself, am part of this system. So are you. The new prosperity brought by SF’s boom hasn’t shared its enormous gains with people of color, women, immigrants, queer and trans youth, our unhoused neighbors, and working-class San Franciscans trying to get by. That’s not “divisive”, it’s reality, and acknowledging it is the first step. In the last four years, I’ve watched our richest and most powerful residents, mostly white male billionaires, spend millions of dollars trying to take away homeless neighbors’ tents, undermine nonprofit affordable housing developers, exploit domestic violence victims’ stories against their will, block commonsense regulations on short-term rentals, and co-opt women’s narratives in their political spending. I’ve also watched those same leaders oppose reforms from the inside, perpetuate racist and sexist work environments for women and people of color who are underrepresented and underpaid, and fire workers for attempting to bargain collectively. There’s a lot of vitriol going around, but even the newest white-collar worker has more in common with the marginalized folks in our city than they do with the entitled dudes at the top who are exercising their financial muscle in our city’s politics. We’re all workers, we’re rent-burdened, we’re trying to make a home for ourselves. Why should we side with the billionaires whose mansions we pay for with our labor, to whom we are expendable, over the majority of our neighbors who are systemically shut out of this new Gilded Age, where corporations are people and money is speech? “A city for all San Franciscans” is meaningless without “justice for all San Franciscans.” We can’t talk about inclusion without addressing that the top 1% of San Franciscans makes 44 times more on average than the bottom 99%. Working to address the severe imbalance of power, privilege and inequality in this city isn’t “playing a zero-sum game” or “pulling up the ladder,” and it doesn’t make you less of a person to admit that that imbalance exists and that you may benefit from it. It makes you a better San Franciscan. Jane “banned the box” to help curb employment discrimination against people targeted by our racist criminal justice system. As Michelle Alexander detailed in The New Jim Crow, black Americans convicted of felonies are systematically locked out of job opportunities for life by employers. Jane made San Francisco the city with the highest minimum wage in the country as the Fight for $15 movement gains momentum nationwide. Jane helped make San Francisco the first city with free City College for ALL, leading to a major enrollment boost and challenging education disparities on race and class lines. Jane wants to make childcare available to all San Franciscans with Prop C, in one of the only developed countries on earth that doesn’t invest in universal early education for kids, prompting women to disproportionately drop out of the workforce. Jane wants to commit $1 BILLION to affordable housing construction, and authored Eviction Protections 2.0 to protect working-class tenants who were evicted for hanging their laundry or leaving shoes in the hallway. Jane supports Prop F, which will make SF the first city in America with a universal right to counsel for tenants facing eviction. Jane successfully negotiated with her opponents on the Board of Supervisors, who wanted to reduce the quota of subsidized, below-market-rate (BMR) units set aside for lower-income San Franciscans. Obligatory eternal reminder that Jane’s district has also built more housing than any other district in the city during her tenure, subsidized or otherwise. Let’s actually embrace the power of every San Franciscan, no matter where we came from how long ago or how little money we make, and take this city back from those who profit by dividing us. 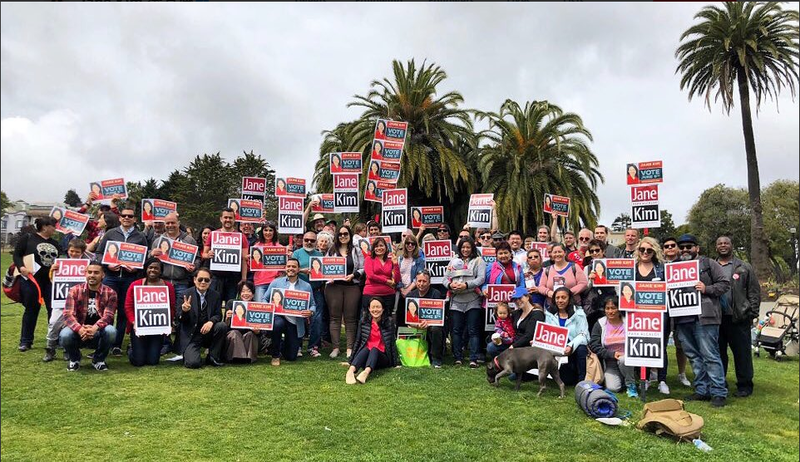 On June 5, cast your vote for Jane Kim: a mayor for the many, not the few. Opinions are solely the author’s own and not representative of any organizations with which she is affiliated.